After last week’s crazy upsets we were all reminded that anything can happen in the last few games of an NFL season. When the Arizona Cardinals can march into Lambeau and not only beat Green Bay but also get their Super Bowl Winning coach fired in the process, we have officially “entered the Twilight Zone” of professional football. So let’s start this week’s rundown with what could almost, possibly, definitely be a Trap Game for the Pittsburgh Steelers. Currently the Oakland Raiders are getting 10½ points at home as Ben Roethlisberger and the boys roll into town on a 2 game losing streak. The rivalry between these two teams has been going on for over 40 years so there’s a bit of history that you need to consider before making your wagers. If you want to put money on Oakland to cover, you should definitely place your bet at the Intertops Sportsbook because they’re currently giving you an extra half point with their +11 spread, while every other book is holding firm at 10½. Now we get to the biggest Underdog of the weekend, the Cincinnati Bengals, who are on the road in Los Angeles on Sunday to take on Philip Rivers and the Chargers. Professional bookmakers have given the Bengals a whopping 14 points with the money line sitting around +450 for an outright win. This ragtag group might need more than 2 touchdowns however, considering that Andy Dalton and A.J. Green are both on Injured Reserve, forcing Cincy to field an inexperienced team. 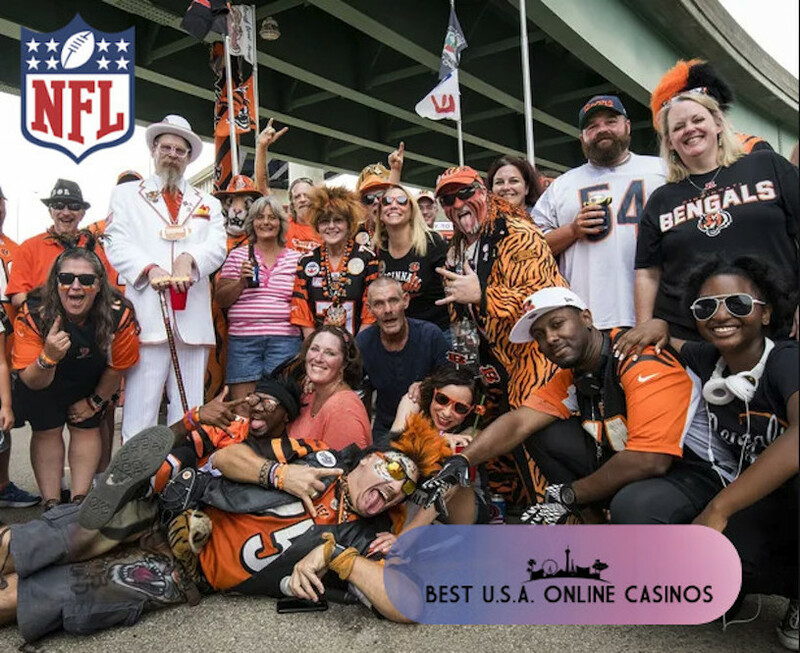 As is usually the case, if you want to wager on the Underdog and get an extra half point, bet at the MyBookie Sportsbook because they have the Bengals at +14½. Sadly there are only two other games with meaty odds dangling in the betting window this week. The Miami Dolphins are +7½ at home against the Patriots, which is strange because it feels like New England loses in Miami every year. The +290 money line bet on the Fins is certainly worth a look. Then we have another Home Dog in the Tampa Bay Buccaneers who are getting 8 points against the dominant New Orleans Saints, even though Tampa already beat them in the Dome in Week 1. The defensive coordinators for the Bucs have a lot of tape to study after the Saints lost in Dallas last week, so this game might be a lot closer than the experts think. A Tampa Bay cover in a 4 team parlay would juice up the payout nicely. 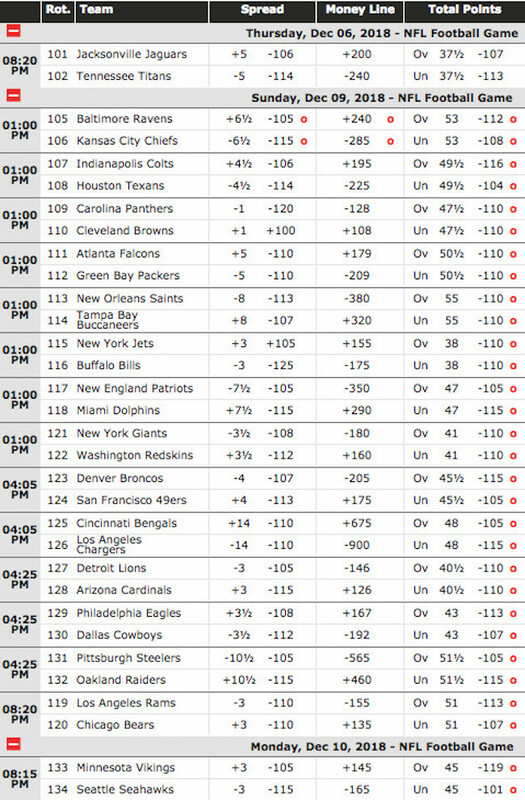 However, if you want to put your action on the favorites you should check out the NFL betting odds at BetOnline because their numbers always lean away from the Dogs. Here are their current lines for Week 14 featuring spreads, money lines, and game totals. Good luck!